We used this visualization to explore a topic we knew little about: Participatory Action Research (PAR). Reviewing the literature is an essential part of a researcher’s life. How do you identify the core works and authors, the different sub-fields, and the hot topics? By providing a comprehensive picture of the literature on this topic available in the bibliographical database Web of Science, this graph served as a very useful map to begin our readings. This graph is a co-citation map with an historical layout. May sound cryptic, but in fact, it is really easy to read! Each node represents a work that has been cited within the Web of Science literature on Participatory Action Research. Two nodes are connected if the two works are often cited together. For instance, “Gläser, 1967, DISCOVERING GROUNDED T” is often cited with “Strauss, 1990, BASICS QUALITATIVE R”. 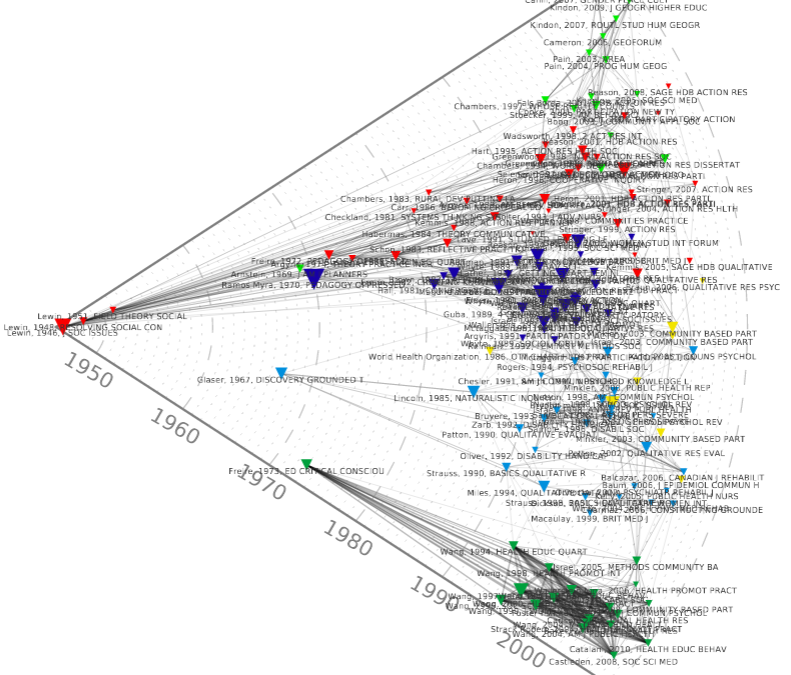 All the cited references, i.e the nodes, are displayed along the time-axis according to their publication year. One can see that the oldest cited reference is “Lewin, 1946, J SOC ISSUES”, and the most recent “Catalani, 2010, HEALTH EDUC BEHAV”. Grouping, or clustering, is done by a community detection algorithm (here, Louvain algorithm). Colored-like nodes are references that are more often cited together than the references from other colored groups. Therefore there seems to be 5 main thematics (in different colors) within the Participatory Action Research literature. What did we learn on Participatory Action Research with this? First, we see that there are 2 seminal works: one from Lewin in 1946, and one from Myra in 1970. Using Wikipedia, we learn that Lewin (UK) developed the popular education and social concept of critical consciousness: getting an understanding of the world and one’s life and taking action against discovered oppressive elements. We also learn that Ramos Myra is the translator of the book “Pedagogy of the oppressed” published by the Brazilian Freire in 1968. Freire worked with illiterate Brazilian adults and proposed a criticism of traditional pedagogy (the ‘banking model’, which considers the student as an empty vessel to be filled with knowledge) based on a Marxist class analysis. Therefore we see that Participatory Action Research roots in Critical pedagogy and teaching for social justice. a diversification of the fields involved (education, management, development, health…, red cluster). In the 90s, discussions on research methodology in the social sciences develop (light blue cluster), especially with “Grounded Theory”. A specific methodology, photovoice, is developed at that time for action research, but it seems rather isolated in use (dark green cluster). Finally, a recent diversification in the 2000s concerns social geogaphy (light green cluster). it favors English-written academic literature. This can be critical, especially to get an overview of a strand of research that developed in non-English speaking countries with an insistance on non-academic outcomes of research! Compress the downloaded files in a single ZIP folder. Now, what about your fields of interest? Can you identify with this method patterns, timelines or citation-cartels you haven’t acknowledged before?